This post was originally supposed to go into depth about one work by one artist: « Girl With Balloon » (also known as « There is Always Hope ») by Banksy. Yet then I read an article about Banksy backlash among graffiti artists; it described other artists defacing his work. 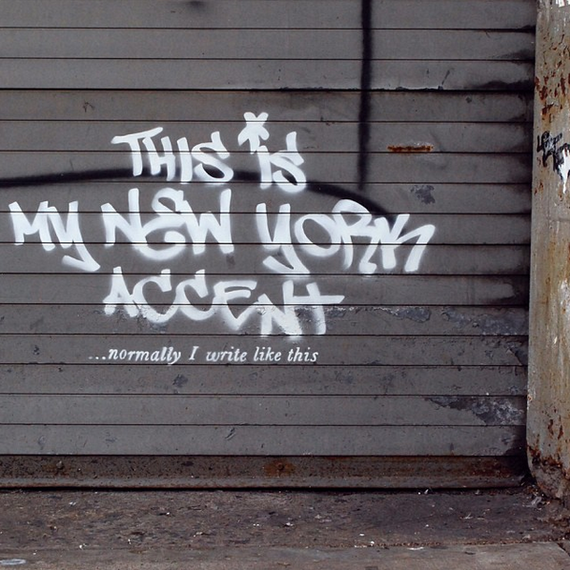 I also realized Banksy had been in the news a lot less since his New York « residency » last year. 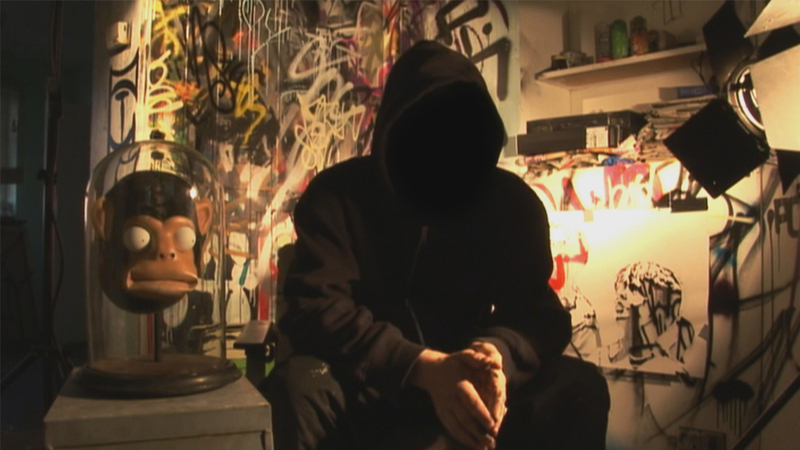 Finally, I watched a video on Banksy’s website recapping his residency. It ended with a joke about his age (38), suggesting Banksy might be feeling too old to be a street artist. 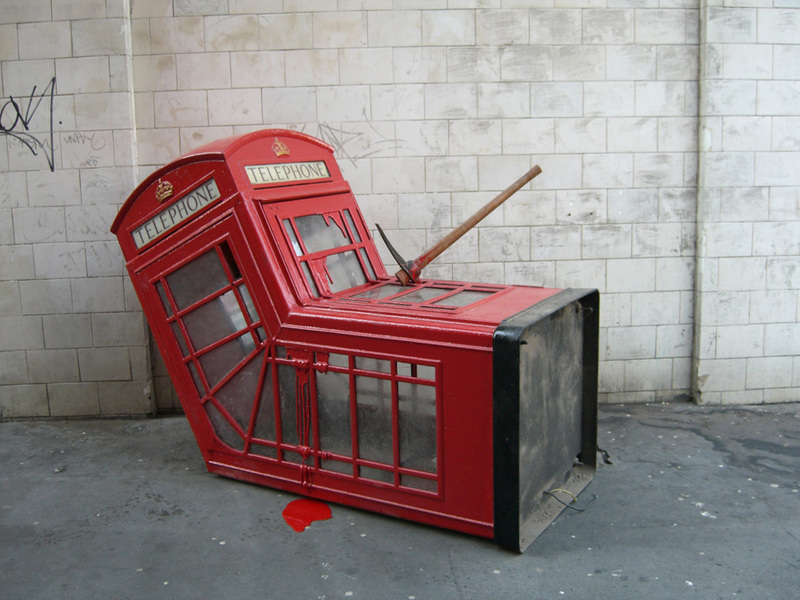 So I started wondering, was Banksy, arguably the most well-known and successful graffiti artist in the world, now over? In other words, was his production permanently slowing down? Could he now be considered part of art history? Or would he start to mean less to the general public and the street art community? While popularity sometimes works against artists in terms of art-historical significance and conceptions of what avant-garde artists should be like, no one can question Banksy’s appeal, especially to young people. What other artist attracts so much attention when a new work is discovered? What other artist’s « residency » would garner press from all over the world? What other artist’s movie would be nominated for an Academy Award? 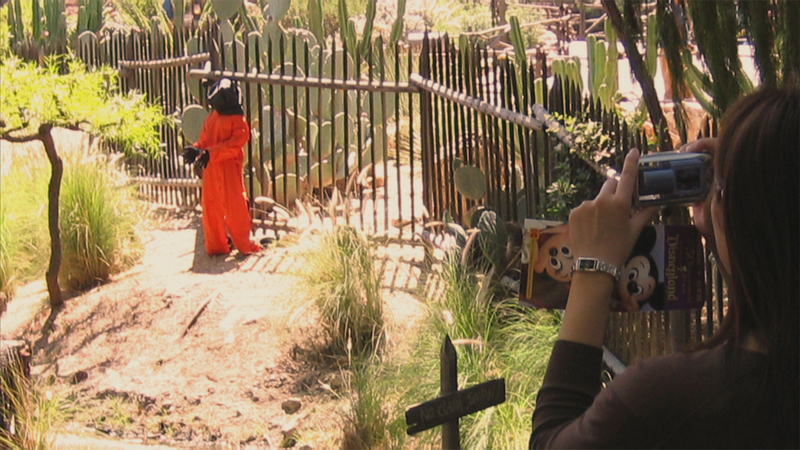 Still from Banksy’s Exit Through the Gift Shop, 2010. While arguments have been made that Banksy is Robin Gunningham and various photos have supposedly captured him at work, no one knows Banksy’s exact identity. The fact that Banksy has kept himself personally anonymous on purpose for so long is such an intriguing, refreshing and powerful statement in our celebrity-obsessed culture, where so much of what we do (especially online) is about creating a unique identity for ourselves and sharing every minute detail about our personal lives. The political nature of his work also connects his anonymity with the larger cultural phenomenon of/fascination with anonymous fighters for injustice, both fictional (i.e. V from V for Vendetta, Batman or the Scarlet Pimpernel), and real-life, such as Anonymous, the Internet activist group. While Banksy’s work has been shown in museums and galleries, he has consistently created art for the greater public outside the traditional institutions of the art world in spaces and places which have no art world connection. In addition to commonly being illegal spaces to create work, Banksy’s venue choices are often highly provocative. Who else has done a series of works along the Israeli West Bank barrier, put a life-size inflatable Guantanamo Bay detainee next to the Big Thunder Mountain roller coaster ride at Disneyland, or « reworked » a Paris Hilton CD with Danger Mouse and inserted it into record stores across the UK? Whether you think Banksy has « sold out » (i.e. compromised his outsider standing by profiting from his work) or not, he (alongside Shepard Fairey) has undeniably helped create a substantial market for Street Art. Artists labeled « Street Artists » or « Urban » artists now are much more frequently featured in galleries and museum exhibitions, included in auctions and bought by prominent collectors because of Banksy’s popularity and creation of his own (even if non-traditional) market. The « boom » in this market has also notably increased the value of 1980s graffiti artists, primarily those from New York, who collectors now look at as historically important influences on the current generation of street artists. A pretty obvious observation about Banksy’s work is how seamlessly it bridges the high/low culture divide more than most artists working today. The example used in the English press? There is no artist who could both have the cover of The Sunday Times magazine and then a few months later the front page of The Sun. Others have commented more generally that you don’t need a degree in art history to understand his work. Banksy’s work is so often thought-provoking and/or requires a substantial amount of technical skill (outside of just being able to paint). He consistently avoids the one-liner (one-dimensional interpretation) in his work in favor of more thought-provoking (even if funny) messages. People still debate the meaning of his « Girl With Balloon » and his seemingly direct works are even worth a second look. 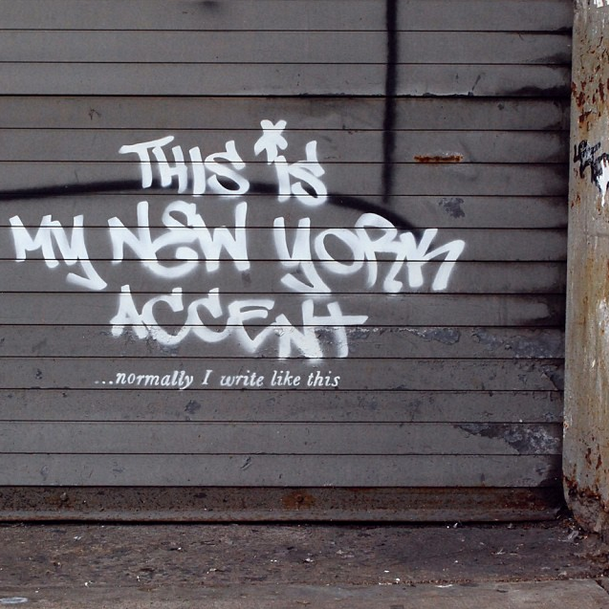 Take his « This is My New York Accent, » which is humorous at first but then prompts questions about what styles we associate with certain cities and suggests we understand the « typical » style of graffiti art as just one mode of possible representation. Banksy’s fabricated sculptures or installations are also highly-complex artworks characteristically not associated with street art. Take, for example, his London telephone booth with a pickaxe in it, or his environments, like the waterfall-in-a-truck he created for New York City. And in addition to his painted works and sculptures, Banksy has created editions, published various books, organized exhibitions and even made a movie about his work. 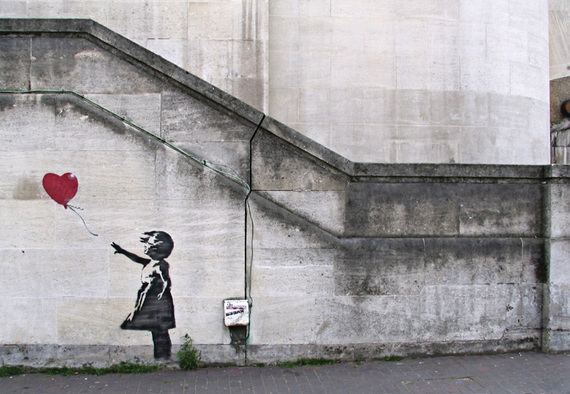 Other street artists have similarly evolved past the wall-painting stereotype as well, but Banksy is generally the most well-known of this group. 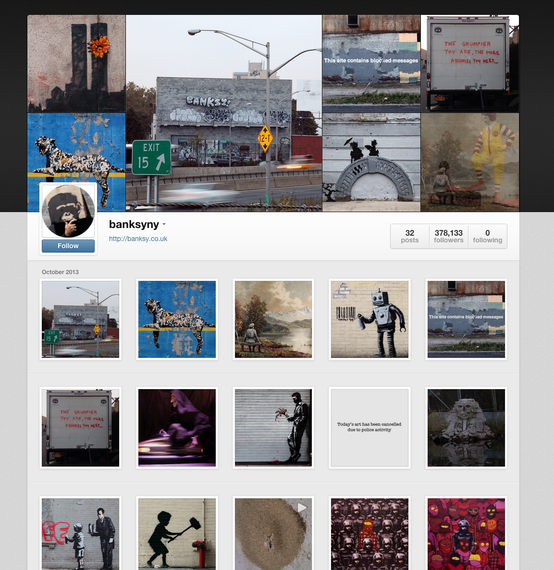 Images from Banksy.co.uk, instagram.com/banksyny, and banksyfilm.com. 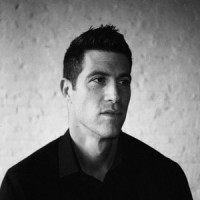 The article had first been publi­shed on The Huffington Post. 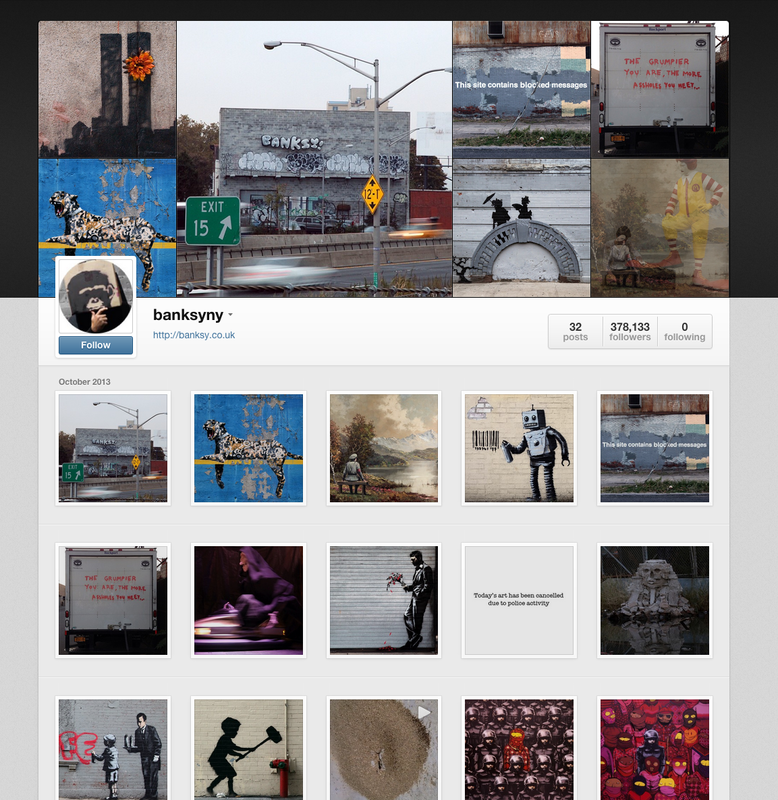 Visit Banksy’s page on Artsy for more on the artist. « Self-plagiarism is style » disait Hitchcock.